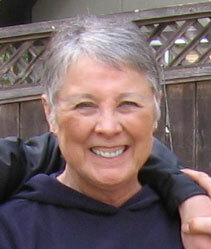 Following a Bachelor's Degree in English from San Diego State in 1963, Roberta worked as a social worker in California and Oregon, gaining expertise in interviewing and research management. Recognizing the importance of how one's surroundings influence health and well-being, she studied architecture at the University of Oregon and earned her Master's in 1975. She subsequently taught design studios in the U. of Oregon Architecture Department. Moving to Seattle in the late 1970's she became the Washington State University Energy Extension Service solar energy specialist, conducting workshops on solar design and energy conservation throughout western Washington. She also consulted on starting new businesses using solar design and produced the plan to institute the first full-service store where solar components could be purchased by homeowners. In the early 1980's the family moved to Mill Valley, California. After co-producing an international symposium on the “Gaia Hypothesis” for the National Audubon Society, she and James co-founded a non-profit organization, The Institute for the Study of Natural Systems. She was its Executive Director from 1988 to 1994. Between 1988 and 1994 ISNS produced five Spirit of Place international symposiums in the US and Japan on the influence of the natural environment on architecture, design and mental health. Some 350 speakers were involved and over 10,000 people attended the series, which includes concerts by Paul Horn, Anna Halprin and R. Carlos Nakai. The symposiums led to her co-authoring two books: Dialogues with the Living Earth (Quest Books, 1996), and Bound to The Earth (Avon, 1993, iUniverse.com 2000) which Kathleen McGinty, Director of the White House Office of Environmental Policy lauded as: "Useful and informative… New insightful approaches to solving the environmental problems we now face." Bound To The Earth was republished in Japan as Designing Sustainable Communities Based On Nature's Wisdom (Forest Publications, Tokyo, Japan, 1998). During this time Roberta was also an adjunct faculty at California Institute of Integral Studies, co-teaching a course on environmental perception in the Socio-Cultural Anthropology department. Working with the American Institute of Architects from 1995-1998 Roberta was the Director of the 1998 Legacy Project which she developed to help architects better understand the residents of public housing. For the 1998 AIA national convention she created a free-standing display, a booklet and a CDROM from the results of interviews with 75 residents of Valencia Gardens, a public housing project in San Francisco. The material from this work is now in the permanent collection of the San Francisco Public Library as the first piece in a national archive on public housing. For her work on this project Roberta was given the AIA Membership Achievement Award for both 1997 and 1998. From March 1999 until March 2002 Roberta was the Executive Director of Philanthropy by Design, a San Francisco-based organization that recruits interior designers and resources to provide design assistance to grass roots non-profit organizations. She received awards for projects including the Certificate of Honor from the City of San Francisco for work in the Bay View Hunter’s Point area and the Northern California Service League’s Award of Recognition for her work with prison-related issues. In collaboration with Dr. Nahid Angha and the Sufi Women Organization, in 2001 Roberta created the Women in Leadership in Faith Project. Over a year she interviewed 35 women religious leaders of Marin County with support from a grant by the Marin Community Foundation. In 2003 she produced a day-long conference on women and religion at Dominican College, which included a freestanding poster exhibit with prayers and bios from the women in the study. That exhibit has consequently been on display at Dominican College. Several additional smaller workshops for women faith leaders have also been held. In 2004 she published a book of prayers drawn from her research on women faith leaders, Hope and Healing In A Troubled World: Stories of Women Faith Leaders (iUniverse.com). The book contains edited interviews with the women that studied and the prayers, poems and inspirations they submitted.